Virginia Muzquiz, internationally recognized as the “Referral Diva”, is an Executive Director with Business Network International (BNI), the Chief Connections Officer with Master Connectors, Inc. and host of the Passion+Purpose=IMPACT Podcast. Well known for her ability to connect the people she meets with people they need to know, Virginia is on a mission to help solo business owners connect to their purpose and their passion so they can build businesses that fund their dreams and have massive impact on the community where they live and serve. Growing up, Virginia’s Dad was a successful entrepreneur, but sacrificed the family in order to build a successful business. Vowing she would not travel that same road, Virginia had her first daughter while still working on her PhD, also joining Mary Kay to help a friend win her car. After she had her second daughter, academia started to interfere with her happiness and being a mom, so she quit. In 2006, Virginia started their No Child Left Behind division and couldn’t get a foot in the door, having no relationships in the urban environment. In 2007, she figured out how to create intimacy with influencers, helping her grow her business. By 2011, they had grossed $2.5M, but in the process, history repeated itself… she found herself sacrificing her family for the almighty dollar. In the midst of all the turmoil throughout her life, Virginia struggled with anxiety and depression. As a kid, she ate to stuff the emotions. As a teen, she starved herself to purge the emotions. As an adult, she “bought attention” and tried Prozac to numb the emotions. Today, she uses meditation, breathwork, acupuncture and a whole lot of emotional transparency to manage the challenges anxiety and depression create. During a year of coaching with Callan Rush and Justin Livingston, Virginia had a powerful “death/rebirth” experience at one of their workshops and ever since had sought to explore deeper realms of consciousness and authenticity and to bring those discoveries to the forefront of business relationships. Her goal is to dismantle current notions of “professionalism” and substitute them with the power of intimacy, influence and impact for scaling business in ways that change their communities for the better. 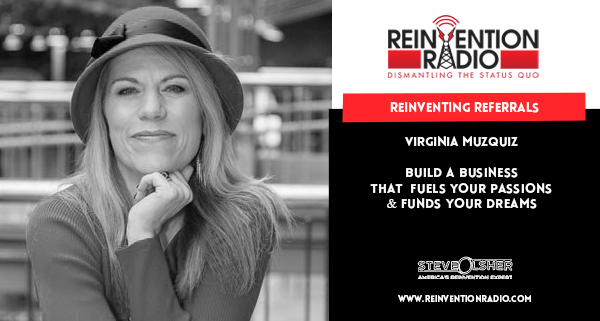 Tune in to hear Virginia chat with Steve, Mary, and Richard about how she helps people build businesses that fuel their passions and fund their dreams. How do you borrow influence? Reinventing Heroes – In this episode, tune in to hear Dr. Chris Zaino chat with Steve, Mary, and Richard about breaking free from your secret identity and finding true fulfillment.